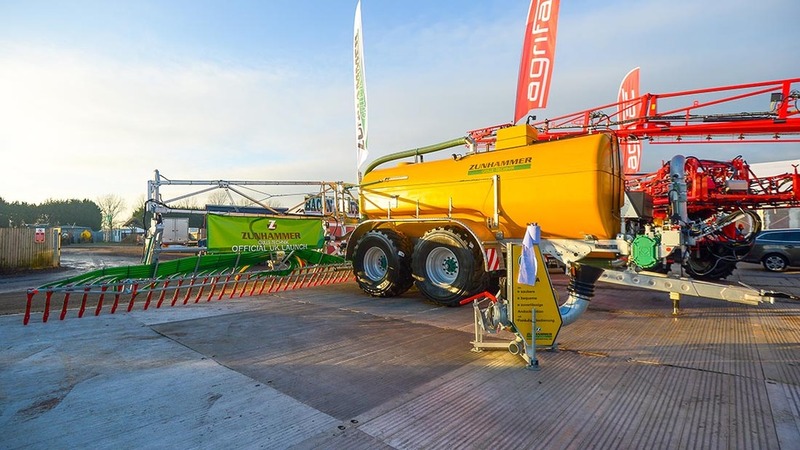 Whether a small livestock farm or large AD plant, all muck and slurry needs were catered for at Lamma. SlurryKat has developed a new range of umbilical hose reels which can be interchanged by only unhooking one pin, says the firm. 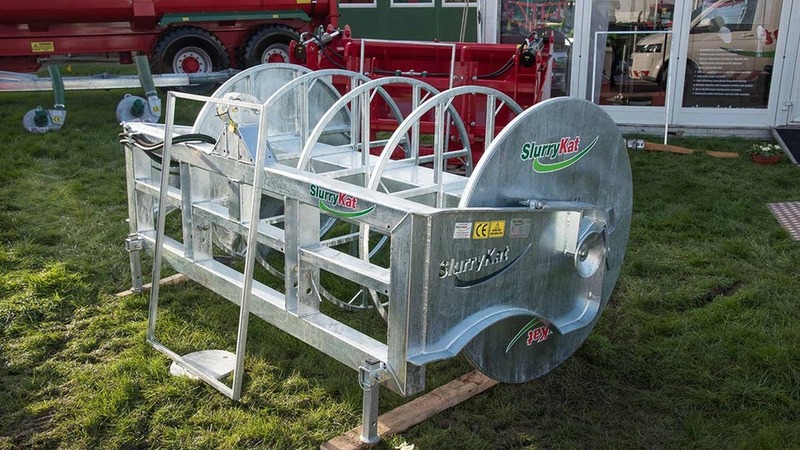 The Northern Ireland company has designed a reel centre or ‘spool’ which carries the lay-flat hose and can be interchangeable on the same chassis or carrier. This means that a contractor can carry multiple spools on a trailer from farm to farm and drop off the empty spools when the hose has been unreeled and lift a full spool to further add to the umbilical pipeline. A standard specification reel is available with a galvanised spool on a painted chassis available in three point linkage or A frame styles. The reel is powered by a protected heavy duty Danfoss hydraulic system. Reels are available with 600m, 800m and 1,000m capacities with divided or open section models made to customers’ requirements. Agrifac UK presented a pair of Zunhammer tankers as part of a new agreement between the March, Cambridgeshire company and Zunhammer GMBH to import and market the complete Zunhammer range of specialist slurry equipment into the UK. 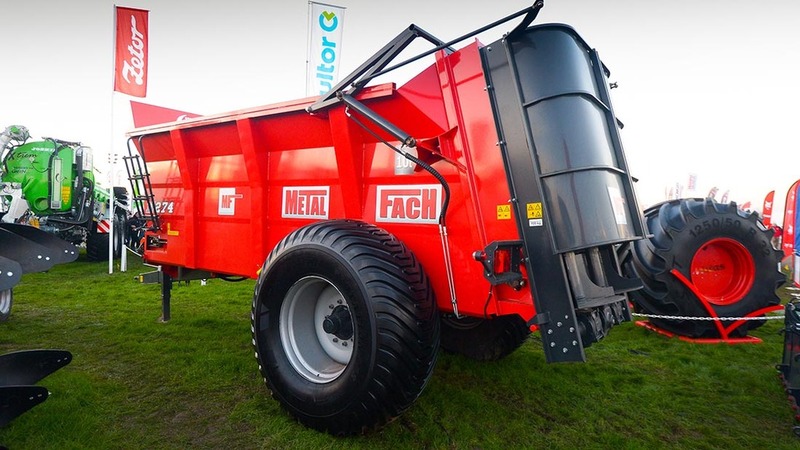 The new agreement means that Agrifac can now offer a complete system for digestate and slurry spreading, with a range of products including self-propelled tankers, storage to field transport tankers, distribution tankers, pump stations for AD plants, dribble bar applicators and cultivators. 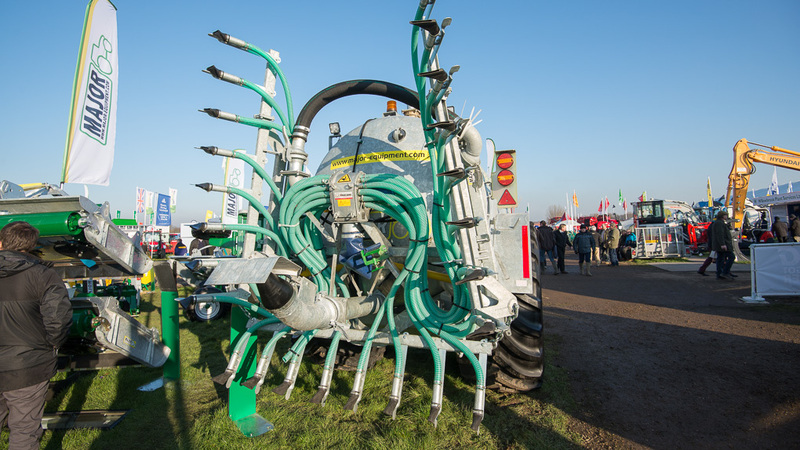 The Zunhammer liquid system paired with the Holmer Exxact TerraVariant has a tank volume of 21cu.m and can inject 25cu.m/ha to give outputs of up to 160cu.m/hr. Filling is achieved while the engine is idling, reducing fuel consumption, via a 5.7m-long suction pipe which can be pivoted 170 degrees to the side. All major functions can be controlled via the TerraVariant’s in-cab joystick, with fully automated regulation of spreading volume through IsoBus control. Adding to its range of rear discharge muck spreaders, K Two has developed a larger spreader, the Evo 18 20. With a capacity of 18 tonnes, depending on material, it features a 2m-wide body and tandem axles with sprung suspension positioned beneath the spreader. The latter allows an overall narrower transport with of 2.7m, but with the ability to fit large 710/50 R26.5 tyres. A rear passive steering axle can be specified as an option. Vertical or horizontal beater can be specified, as can weigh cells which afford full automatic rate control of spreading. Available now, the machine starts from £60,000. Suitable for most slurry tankers, Major Equipment’s latest trailing shoe applicator is designed to fit on a simple linkage and be close coupled, allowing wider units to be carried – 6.4 ad 7m models are currently available. The company points out that trailing shoe applicators improve the accuracy of slurry application and allow a quick return to grazing while putting less strain on the linkage or tractor than injectors. Prices are from £16,280 to £17,500. HVM Agri is the importer for the Dezwaef range of tankers, built in Moerkeke, Belgium. Models range from single axle budget models to twin or triple axle specialist road or field tankers with trailing shoe, dribble bar or cultivator injector applicators with a choice of tyre equipment. The entire range is galvanised for strength and options include a turbo filler said to reduced filling time by 40 per cent, flow metre and touch screen control box. Prices for a basic single axle model starts from £12,000. 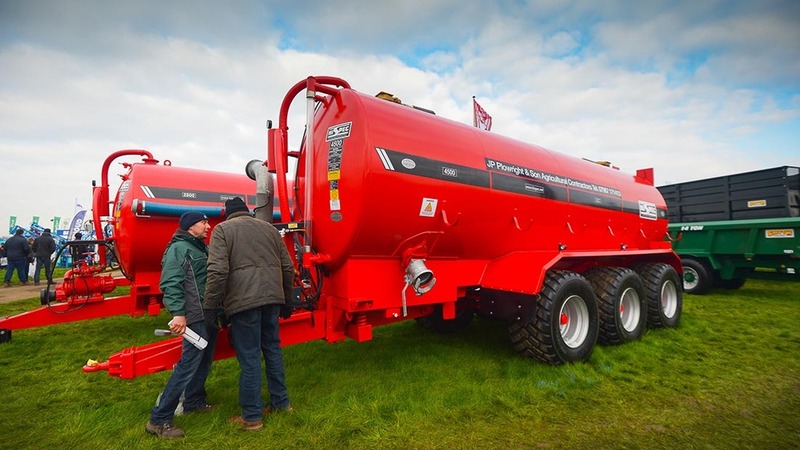 Designed to keep field spreading systems running, Hi Spec Engineering introduced a new 20,450 litre (4,500 gallon) high capacity transport tanker at the show. To spread weight, the tanker is carried on triple, high road speed axles with hydraulic braking and fitted with 600/50-22.5 tyres. The tank is manufactured from 6mm thick steel and mounted on a full frame chassis to ensure that it is completely supported, says the manufacturer. For filling, the tanker is fitted with a high capacity 14,000 litres per minute pump, while at the rear of the tanker there is a 200mm (eight inch) pipe and cone to accommodate the filling boom from the spreading vehicle. Zetor UK is extending its MetalFach implement offering, with a wide range of machinery including arable and grassland equipment. 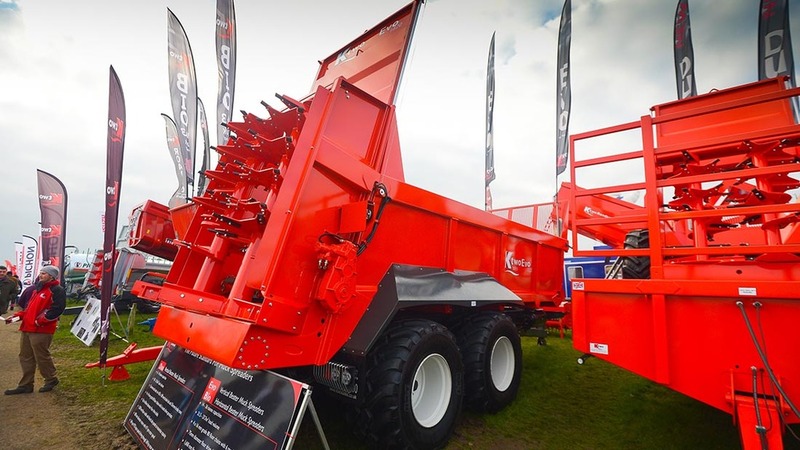 Polish built, Zetor’s stand featured the MetalFach N274 rear discharge muck spreader. With a capacity of 10.6cu.m, it can handle 10 tonnes of muck and features vertical beaters and a single axle fitted with 600/55 R26.5 tyres. Zetor will once again be on tour of the UK this season demonstrating its tractors, where visitors will also be able to see and try MetalFach ploughs and cultivators.